In the lesson we will deploy a sample Golang application to a Cloud Foundry platform. In your own Concourse pipelines you could deploy any application to any target platform. For convenience, we're reusing the tutorials/basic/job-inputs/task-run-tests.sh test script from lesson Job Inputs. This will fail due to missing parameters. To complete this lesson you will need access to a Cloud Foundry. I'd like to suggest you try Pivotal Web Services which is run by Pivotal, the company who funds the core Concourse CI dev team. They offer free trial credit which will be more than sufficient for this lesson. 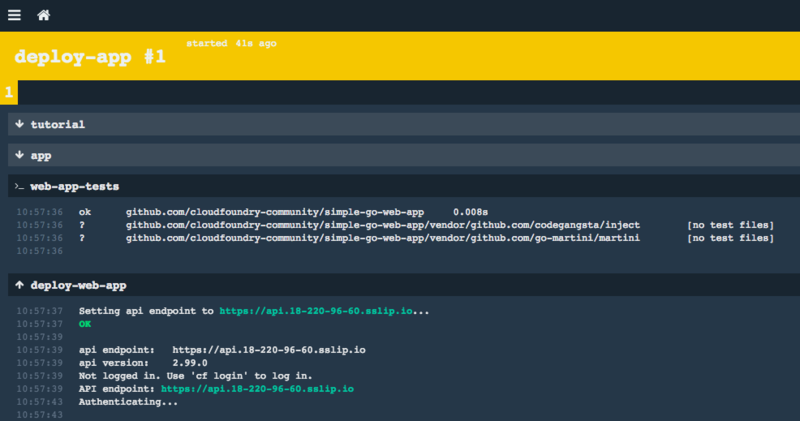 After signup, visit https://console.run.pivotal.io/, and after navigating to your "org", create a new "space" called run-tests-before-deploy. This lesson's pipeline will deploy a sample app into this space. The example pipeline.yml in the lesson folder uses the cf resource for deploying the application via put: deploy-web-app. You could use any resource (or a handcrafted task) to deploy your application instead. Declarative deployment platforms like Cloud Foundry and Kubernetes can trivialise our pipeline implementation. They are the "Just Do It" of CI/CD deployment orchestration. As introduced in Parameters and Secrets with Credentials Manager , the ((cf-api)) syntax is for late-binding variable, secret, or credential. This allows pipeline.yml to be generically useful and published in public. It also allows an operator to update variables in a central place and then all jobs will dynamically use the new variable values on demand. You can now delete the sample app from your Cloud Foundry account. 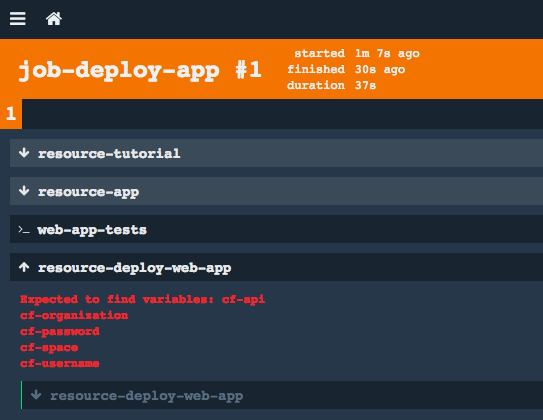 If you are using Pivotal Web Services, visit https://console.run.pivotal.io/ and navigate to the run-tests-before-deploy space to find your application and delete it.